Also called "Westfir Covered Bridge," the Office Bridge is bright red and features a separate pedestrian walkway alongside its high-roofed, one-lane crossing. It is also the longest covered bridge in Oregon. For the holidays, Office Bridge is festively lit up with lights which are ceremonially switched on by Santa Claus driving a fire truck. The Westfir community started as a company town belonging to the Westfir Lumber Company. Other smaller mills had previously operated in the vicinity and a bridge already spanned the North Fork of the Middle Fork of the Willamette River where the mill pond was located. High waters washed out the original bridge, so a second was built in 1941 to provide access from the mill to the Westfir Lumber Company&apos;s administrative offices. This bridge lasted only four years before a storm took it out too. The third and current bridge was built higher to avoid storm waters and was designed to handle the size and load of logging trucks. It is the only bridge in Oregon with a separate pedestrian walk way. Windows provide excellent views of the river. The bridge is also constructed with triple trusses and is an impressive 180 feet (55 m) long. In 1977 the bridge and other holdings were divested by Westfir Lumber Company. In the early 80s the mill burned down and the privately-owned bridge was closed. 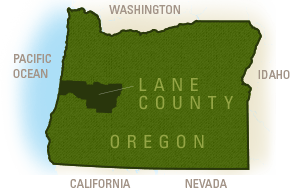 The property passed through several private holdings until, in 1992, Lane County foreclosed on the current owners for back taxes. At that time the county initiated structural repairs and reopened the bridge. A small park with restrooms was also established at the north end of the bridge where it is the trail head for the North Fork Trail. 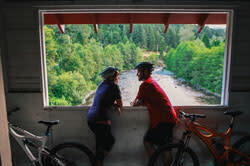 With the proximity of trail heads, the Willamette River and the ski slopes; this is a hub for cyclists, hikers, paddlers, anglers, skiers and drivers touring the region. Office Bridge was given a new roof in 2002. Office Bridge is available for special events through the City of Westfir. Also known as "Westfir Bridge," Office Covered Bridge spans the North Fork Willamette River at 180 feet (55 m). It was built in 1944 to connect logging trucks with the lumber mill administration building. DIRECTIONS: Located at the north edge of the town of Westfir.